Note: 2017 includes reported installations for January–October and reported planned installations for November–December. 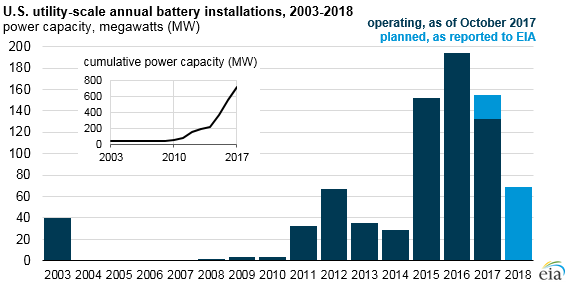 Driven largely by installations over the past three years, the electric power industry has installed about 700 megawatts (MW) of utility-scale batteries on the U.S. electric grid. 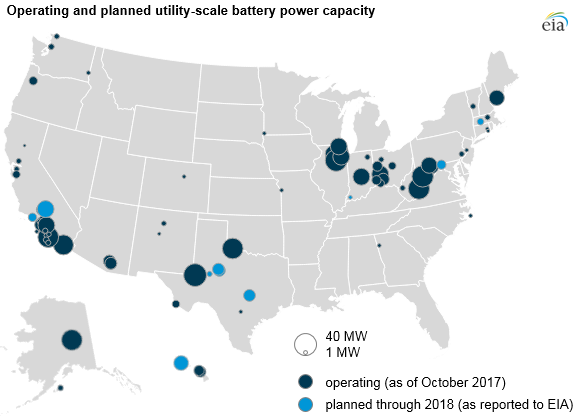 As of October 2017, these batteries made up about 0.06% of U.S. utility-scale generating capacity. Another 22 MW of batteries are planned for the last two months of 2017, with 69 MW more planned for 2018. New energy storage information available in the 2016 edition of EIA’s Annual Electric Generator Report provides more detail on battery capacity, charge and discharge rates, storage technology types, reactive power ratings, storage enclosure types, and expected usage applications. Batteries, like other energy storage technologies, can serve as both energy suppliers and consumers at different times, creating an unusual combination of cost and revenue streams and making direct comparisons to other generation technologies challenging. The decision to build a new power plant depends in part on its initial construction costs and ongoing operating costs. Although battery projects have a relatively low average construction cost, they are not stand-alone generation sources and must buy electricity supplied by other generators to charge and cover the round-trip efficiency losses experienced during cycles of charging and discharging. A battery’s duration is the ratio of its energy capacity to its power capacity. For instance, a battery with a 2 MWh energy capacity and 1 MW power capacity can produce at its maximum power capacity for 2 hours. Actual operation of batteries can vary widely from these specifications. Batteries discharged at lower-than-maximum rates will yield longer duration times and possibly more energy capacity. Short-duration batteries are designed to provide power for a very short time, usually on the order of minutes to an hour, and are generally less expensive per MW to build. Long-duration batteries can provide power for several hours and are more expensive per MW. Balancing grid supply and demand. Batteries can help balance electricity supply and demand on multiple time scales (by the second, minute, or hour). Fast-ramping batteries are particularly well suited to provide ancillary grid services such as frequency regulation, which helps maintain the grid’s electric frequency on a second-to-second basis. Peak shaving and price arbitrage opportunities. By buying power and charging during lower-price (or negative-price) periods and selling power and discharging during higher-price periods, batteries can flatten daily load or net load shapes. Shifting portions of electricity demand from peak hours to other times of day also reduces the amount of higher-cost, seldom-used generation capacity needed to be online, which can result in overall lower wholesale electricity prices. Storing and smoothing renewable generation. Storing excess solar- and wind-generated electricity and supplying it back to the grid or to local loads when needed can reduce renewable curtailments, negative wholesale power prices coincident with wind and solar over-generation, and price spikes related to evening peak ramping needs. Co-locating batteries with solar and wind generators allows system owners to more predictably manage the power supplied to the grid by combined renewable-generator-and-battery systems. Deferring large infrastructure investments. Local pockets of growing electricity demand sometimes require electric utilities to build expensive new grid infrastructure such as upgraded substations or additional distribution lines to handle the higher demand, which can cost upwards of tens of millions of dollars. Installing batteries at strategic locations, at a much lower cost, enables utilities to manage growing demand while deferring large grid investments. Reducing end-use consumer demand charges. Large power consumers such as commercial and industrial facilities can reduce their electricity demand charges, which are generally based on the facilities’ highest observed rates of electricity consumption during peak periods, by using on-site energy storage during peak demand times. Back-up power. Batteries can provide back-up power to households, businesses, and distribution grids during outages or to support electric reliability. As part of an advanced microgrid setup, batteries can help keep power flowing when the microgrid is islanded, or temporarily electrically separated, from the rest of the grid.